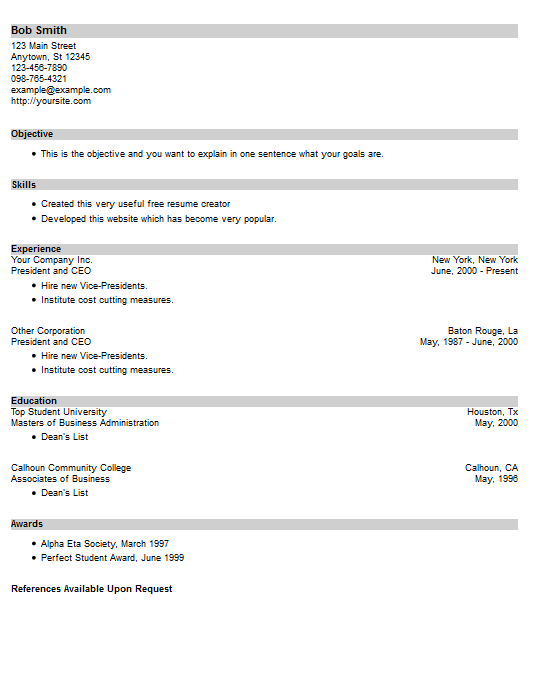 Here we have a relatively compact resume template, your name and the section headings are placed within colorful backgrounds to bring attention to them. An important tactic to use when writing your resume is to make an effort to draw attention to your assets. Then, the hiring manager will see them and think, wow this person is exactly who I was looking for. If that happens, then you have achieved your goal and all the work you put into writing your resume has paid off. Style number seventeen is a moderately compact design, if you don't have much content to write into your resume this could help fill up the page with its solid heading backgrounds. The job and school sections are more compact offsetting the space taken up by the colorful backgrounds. If you don't have many jobs or sources of education you probably could fit everything on one page. The colorful sections create interest and make the sections seem more filled and distributed throughout the template. The colors also divide each area, the employer can visually jump to each area just by looking at the colors. You can choose any color from our built-in color picker. The same goes for the color of your text. If you do find yourself with a resume that is sparsely populated because of insufficient content that you have available to write, don't be tempted to put your references on there. This is not the correct way to supply them to the employer. Instead, create a reference page using our creator or read our article about how to write a reference page. If requested you can hand in the reference page along with your resume and cover letter. The best way to fill your resume template is with actual quality content, real facts about you that can be used in this new job. Grab this template and others from our creator program that can be accessed here.